Well, Matt Kenseth did beat Jimmie Johnson here in Sunday's Martinsville 500, an achievement in itself, considering Johnson's eight career wins at this flat half-mile and Kenseth's zero wins. 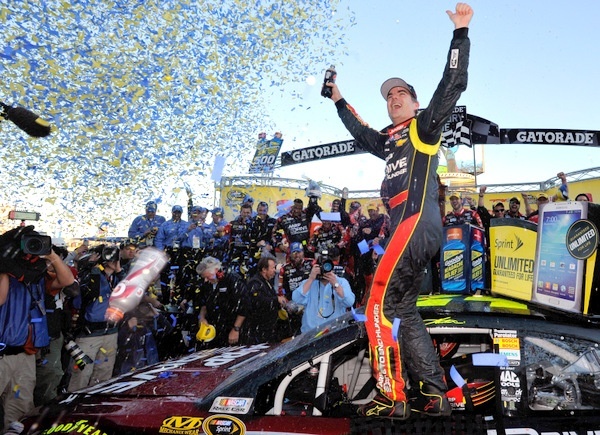 But Jeff Gordon slipped around Kenseth for the lead in the final miles and edged away to win Round Seven of the 10-race chase. That may keep him alive, though just barely in NASCAR's championship chase. So with three races to go, Johnson and Kenseth are tied atop the Sprint Cup points lead heading this week to Texas Motor Speedway. Kenseth does have more wins this season, which would be the tie-breaker at the end of the season. Kenseth, who led more laps, 202 of the 500, than anyone else, said "I felt this race was an opportunity for us. We were good here in the spring, and we were good at Loudon too. "I thought we'd have a shot to win. "I think my inexperience here cost me. I just got beat by experience and a better driver at this track. I was hesitant to get off my line, like Jeff would do. I never had enough cushion on him to do it. And every time I tried it, he would gain two lengths on me, because it takes a couple laps to figure out what a new line might do. "But I was optimistic coming into this race. Not as happy as Jeff, but happy to run second. 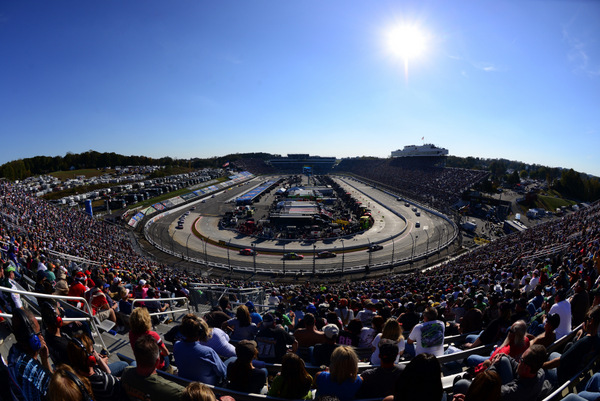 As tough as Martinsville has been for me, how can you not be happy. "I feel we've got what it takes to race Jimmie these next three tracks. "Man, we're in it, and we're going to three good tracks." That's Texas, Phoenix and Homestead. "I thought we'd given it away a couple of times," Gordon said. "That was a good bullet-dodge for Matt," third-place finisher Clint Bowyer said. "No, it wasn't," Kenseth replied with a laugh. "If you'd been driving, you'd have won." "Well, we won't go there," Bowyer said. That was reference to some run-ins Bowyer and Gordon have had, principally one at Phoenix last fall when Gordon wrecked Bowyer late in the race to take him out of the championship hunt. That led to a hard confrontation between those two afterwards. Kenseth clearly was implying Bowyer would probably have been hungry enough here to do whatever it took to win....while Kenseth realized he still has a championshp to win. Bowyer and Kenseth crossed the finish line side by side. Bowyer, who drove like a honey badger throughout the race, said "If it was for the win, he'd have probably gotten out of the way, because I'm pretty hungry." Bowyer has been in a funky mood since that Richmond controversy and this was his first very good race since then. Johnson and Greg Biffle had a rough brush during the race, and they met on pit road afterwards to discuss their disagreement, pointing fingers. Biffle, who finished ninth, said he felt Johnson had banged him up unnecessarily. "We finally had a good car at Martinsville, and just got the rear bumper torn off," Biffle said. "It takes a lot to tear off a rear bumper here. "He claims he was inside of me. But it felt he came across me." Biffle was about the only Ford driver who had anything strong Sunday. 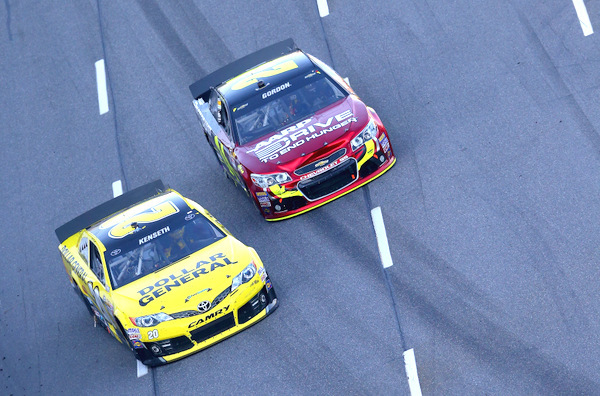 Gordon was strong throughout the race but not as strong as Kenseth until the very end. Gordon passed for the lead with 10 miles to go. Kenseth, still winless here in his career, clearly had the best car, particularly on short runs. But he said he was hesitant to change his line through the corners late in the nearly four-hour race when challenged for the lead by Gordon. "I was running by the curb all day, and that's what got me there, and I never had enough breathing room on Jeff to move up and run the line that a lot of them were on entry to run higher and then drive straighter off the corner," Kenseth said. "At the end of the day I hurt me. It made the car too tight. At the two‑thirds mark, I would just start sliding the nose." The race slowed 17 times for wrecks or debris; the record is 21 yellows, but this race was filled with remarkably sharp racing, especially on restarts. The outside lane was considerably slower than the inside line, and anyone restarting in the outside line was at a clear disadvantage. So on pit stops, when leaving pit road, drivers would -- incredibly it might seem -- count cars, so they could get the inside line for the restart. Johnson, Kenseth said, "was very, very aggressive, for the point leader, to be dive bombing to the inside. I was all over the brakes to keep from running him over a couple times. But that's how important it is to get to the inside on these restarts." Submitted by Henry on Sun 10/27/2013 - 20:57. The race I saw was about goodyear, gen 6 and the track/temperature AGAIN. 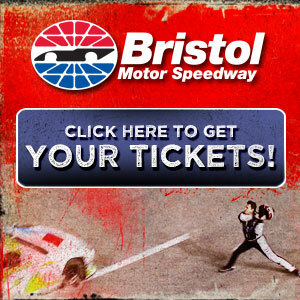 Kenseth has raced at this track 28 times and claims he doesn't "know how", give me a break. Clearly his car faded on long runs and by far the longest run was at the end. Time and time again Kenseth was on the inside and/or first place. (And I got news for him he better start thanking "the team" in his interviews, they just don't seem to make mistakes on pit stops. I listened (tv) and he thanked others, not his team or pit crew.) With how sorrow the conditions were with no possibility of real passing Biffle and the rest have no complaints about bunping. The Gibbs cars and their perpetual "trick stuff" are by far the best cars, and there shouldn't be any "race" to it!! Submitted by Clem Zahrobsky on Mon 10/28/2013 - 07:50. Matt and Jimmie are playing games to keep the fans interested at NASCAR request. They just keep track of each other and race accordingly. And NASCAR penalized MWR for playing games. Submitted by Paul Watson racing on Mon 10/28/2013 - 12:52.